The FS#1 flight controller is designed to measure basic weather information (Barometric Altitude, Air Pressure and Temperature) and relay that information periodically to the ground via radio telemetry using the FSQ protocol. Additionally, the flight controller conserves battery power by turning off the radio and weather sensor between transmissions. Increment a loop counter, counting the # of loops performed. Power up and configure the weather sensor board and radio board. Format a telemetry message string to be sent. Send a CW carrier for 5 seconds to help fine tuning adjustments to the receiver tuning before telemetry data is sent. Send the telemetry message via FSQ protocol (alternates between 2 & 6 baud on each loop) on the chosen frequency. Turn off power to the weather sensor and radio. Sleep for one minute and then end the loop. 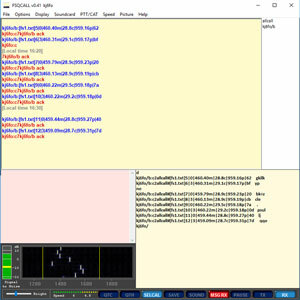 The following is a sample of the first five telemetry messages sent by FS#1. This data was from a test run that was on my workbench. You can see there is some “movement” in the data which is just noise. The first part of every message is information that is required by ham radio rules and also part of the FSQ protocol. kj6fo/b is my radio callsign with /b added for balloon. :c2 is a CRC check digit calculated from my callsign. This is used at the receiving end to validate my call sign was received correctly. allcall is the “To” field, in this case the message is directed to everyone listening. The “|” character is used to separate the data fields. 1 – indicated this is the first message to be sent. 0 – is the baud rate enumeration. 0 is 6 baud and 3 is 2 baud. FS#1 telemetry alternates between these two speeds on each transmission. 962.19p – barometric pressure in hecto-pascals. 63 is a message CRC check digit used to validate the contents of the telemetry message. What is a Cyclic Redundancy Check? A cyclic redundancy check (CRC) is an error-detecting code commonly used in digital networks and storage devices to detect accidental changes to raw data. For more information visit Wikipedia. I documented the code with plenty of comments. I will only describe a few portions of the code here. The FSQ protocol code was adapted from work published by a number of other hams. The details are documented in the comments at the top of the Arduino sketch. My major change to the FSQ code was to change the timing from interrupt based timing logic to using delays(). Interrupt based timing is more accurate than the delays, but it is also not portable between different processor speeds. With more and more new Arduino compatible devices coming into availability, I decided to make the change to delays() functions. The delay() function is accurate enough for the slow baud rates of FSQ. The BaudDelay() function delays the appropriate amount of time for each character sent and the start of the next character. The Si5351A board I am using is from Adafruit, however I am using the EtherKit library because it was easier to work with when selecting frequencies. The remaining libraries are the normal ones for the hardware used. At the top of the file there are a number of Defines and globals that control the behavior of the flight controller. The first define, DIALFREQUENCY, sets the desired dial frequency of the receiver in Hertz. Make sure this value is set to a frequency that you are legally allowed to use. FS#1 will transmit at 28.140Mhz (28140000 Hz). The Si5351A boards have some variances in the frequency they output from the desired frequency. The following defines are used to set the board to the actual desired dial frequency. CALIBRATIONADJUST is an adjustment factor you can use to calibrate the SI5351A, if you can accurately compare the Si5351a to a stable frequency standard. Because I don’t have a suitable frequency counter, I left this value at zero and used the define FREQADJUST instead. The value of FREQADJUST was determined by through a trial and error process. I tuned in the telemetry on my receiver to the dial frequency and noticed the amount of error from the SI5351A. Then I adjusted FREQADJUST by this error amount and repeated the process until I had the signal fine-tuned. It is important to note, the Si5351A board will drift in frequency with temperature changes so, in the field, your frequency may be different than where you calibrated it. Frequencies on the Si5351A board are specified in 100ths of hertz, but to keep the code easier to read the defines in Hertz and will be multiplied by 100 later in the code when the Si5351A is set to the frequency.. The base transmit frequency is calculated as (28140000UL + 1350UL + FREQADJUST) which puts the transmitter at a dial frequency of 28.140 Mhz. The FSQ tones start at 1350hz above the carrier frequency so this value is added to the dial frequency. The frequency adjustment is then added to this number to calculate the desired dial frequency. The define TONE_SPACING defines the tone spacing of the FSQ characters. FSQ uses tones 8.7890625Hz apart. The SI5351A has a tuning resolution of 100ths of Hertz so we use the value 879 (8.79 Hz) for this tone spacing. It is close enough in value to work. // Adjusted to individual boards as needed. // Each Si5351A is slightly different. The FREQADJUST is an offset to the desired dial frequency to compensate for board variances. FSQ tones are separated by 8.7890625hz. TONE_SPACING specifies the closest value in 100th Hertz. The following section defines the Baud Rates, between 2 and 6 baud, supported by FSQ. The SLEEPYTIME define specifies the delay between the end of one transmission the start of the next. FS#1 will delay one minute between transmission. // Interval from the last Xmit to the start of the next Xmit. char MyCallSign = “YOUR_CALL_SIGN_GOES_HERE”; sets the callsign of the balloon. Be sure to change this to your own callsign. The rest of the defines and globals are part of the FSQ protocol and deine the character table used in sending FSQ. The functions are well documented in the code, so I will just give a brief description of the important functions here. setup() – The standard Arduino function used to initialize the program variables and hardware pins etc. The CRC tables and the callsign CRC is computed here. The power management Pin is initialized and powered “Off”. loop() – the main Arduino loop function. This function performs the steps of the loop described above. XmitTelemetry() – Sends the telemetry message via the radio. XmitTone() – Sets the radio to the frequency needed for the character being sent. ComposeTelemetryMsg() – Formats the sensor information into the Telemetry string. StartRadio() – This function initializes the Si5351A board after it is powered up and gets it ready to transmit. PowerOn() – Powers up the radio and weather boards by turning the POWERENABLEPIN pin to high which turns on the 2n7000 switch in the circuit. PowerOff() – Set the POWERENABLEPIN to low which cuts power to the radio and weather board. // by Don Gibson. See http://SquirrelEngineering.com for more details. // Breakout Board, by Jason Milldrum NT7S. // string, including the pipe characters. // if more power savings is desired. // Pin used to control the on/off state of the transmitter board and sensor, to conserve power when not in use. // Using metric data values to keep the telemetry data shorter, requiring less transmit time and power consumtion. long XmitCount = 0L; // Count of xmit cycles. float AltM = 0.0; // Barrometric altitude in meters. Based on standard sea level value. // FSQ Protocol vars and data structures. // Get the hardware and program set up. // Set up power control pin. This pin will turn on/off radio & sensor etc. // Turn on power to radio and sensor, init sensor. else // default to zero values. // Zero values so we dont get old readings. // To evaluate the differences between baud rates, FS#1 will change baud rates on each transmission. // This is not essential code and you can change this without issues. delay(SLEEPYTIME); // Rest until next time. // Send the telemetery string. Loop through the string, transmitting one character at a time. digitalWrite(LED_PIN, HIGH); //Turn on LED to show Xmit is on. delay(500); // Warm up the xmitter board output. May depend on frequency. Higher freqs are less stable, maybe longer. // Transmit a tone to aid in tuning the reciever. Freq will drift as tempreture changes. This gives you 5 seconds to fine tune the receiver. XmitTone(0); //Transmit space tone - used to adjust rcvr. delay(5000); // Transmit for 5 sec. Adjust or remove this line as desired. // character we're trying to send. // only transmit one tone for this character. // Transmit the next character tone. // Delay based on the current baud rate we are using. This is the duration a character tone will be sent. // callsign:crc allcall #[logfile.txt] -- Note spaces are added for readability, they are not part of the message. delay(200); // Warm up Needed?